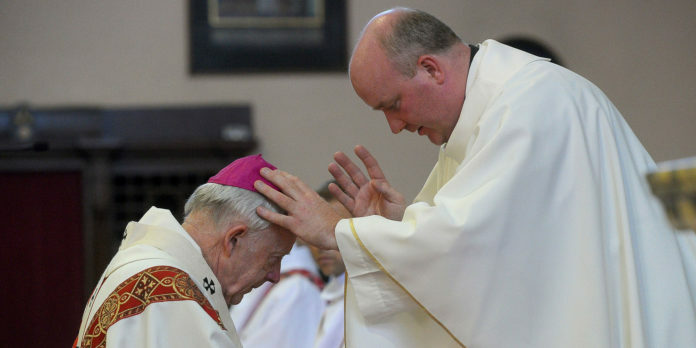 Fr John Regan giving a blessing to Archbishop Michael Neary at his Ordination in St Mary’s Church. (Pic Conor McKeown). I welcome you all as we come to celebrate this special day in the life of John Regan and his family and the life of the Pallottine Order and the life of the people of John’s parish of Kilmeena and Westport. Welcome to the Provincial, Fr. Derry Murphy, the Director of Formation, Fr.  Michael Irwin and the members of the Pallottine family, to Canon James Walsh, the priest in Kilmeena, to Charlie McDonnell, the Administrator and Fr. Patrick Burke, C.C., the people, religious and priests of the area. Welcome to John’s colleagues and staff members from St. Patrick’s College, Maynooth. As we come to celebrate the Ordination of Reverend John Regan we thank God for the Society of the Catholic Apostolate, better known as the Pallottines, founded by St. Vincent Pallotti in 1835. The aim of this Society is to increase the collaboration among the faithful of the Church, that is among the Diocesan Priests, the male and female religious and the laity, to fulfil fully and more efficiently the apostolic tasks. The Founder St. Vincent was especially marked by the deep desire to revive faith, to rekindle charity as he worked with rich and poor alike. He taught that every human-being is a mirror of God, worthy of reverence and love. He also proclaimed that the role of each Christian is to be a sacrament of Christ’s presence in the world. Today we realise how relevant and how urgent that message of St. Vincent is for Ireland today. I had the privilege 20 years ago of ordaining another priest for the Pallottine Order, Fr. Brendan Walsh in Partry, Co. Mayo. On the day John Regan was brought by his parents the late Michael and Annie to the Church to be baptised, did the question which surrounded John the Baptist in today’s Gospel, run through their minds “what will this child turn out to be”? And St. Luke continues “and indeed the hand of the Lord was with him”. Today the Lord is with John Regan in a very special way and promises to accompany him and to direct his priestly ministry. On this Feast of John the Baptist we realise that John the Baptist’s vocation was to point out the saviour and that vocation must be relived by each one of us. Today the Lord anoints John Regan to take on a special role in discipleship as he points to the Lord and encourages others to become disciples of Jesus Christ. John assumes this new responsibility at a time of rapid change in our country and in our church. The sociological props which were there in support of faith in the past are being belted away one by one. This can impinge on people of faith in general and on priests and on future priests in particular in two ways. On the one hand there is the temptation to accommodate and compromise in our faith and its implications for lifestyle. On the other hand it is an opportunity for us to deepen our faith and respond in a courageous way as we cope with the challenges of a culture which at times is endeavouring to behave as if God did not exist. Ours is a time for deepening of faith and responding with courage. In his exercise of priestly ministry John will return time and again to the words of the risen Lord to his disciples in the Gospel of Matthew: “go make disciples of all nations, baptising them in the name of the Father, and of the Holy Spirit; teaching them to observe all that I have commanded you; and behold, I am with you always, to the close of the age”. As John sets about making disciples for Jesus Christ he will always acknowledge the responsibility of being a disciple in his own life and he will never require of others what he has not first demanded of himself. He will use his human qualities, his interests, his priestly training and technological resources in making disciples. He will do so with courage but also with an understanding of and making allowances for human frailty. He will sustain the people of God by the sacraments of Jesus Christ, baptising and welcoming new members into God’s family, sustaining them with the Eucharist and the word of God. He will forgive sins not yet committed, bless their married love, he will have responsibility for introducing them to Jesus Christ. Realising that they will not be able to maintain their relationship with Jesus Christ if they are only fed a diet of secular philosophy he will endeavour to teach them the ways of Jesus Christ and enable them to appreciate the beauty of Christ’s gospel. All of this may at times appear to be counter-cultural and a huge challenge and yet John has to realise that he is dependent on and a vehicle of Jesus Christ himself who reminds us in those final words to his disciples. “Behold I am with you always to the end of time”. John will exercise his priestly ministry in close co-operation with his brother priests and with the people of God whom he serves. Like John the Baptist he will always realise that he must point away from himself towards Jesus Christ: “he must increase, but I must decrease”. On this joyful occasion I congratulate Fr. John on his ordination to the priesthood, his family, his neighbourhood, Fr. Jerry Murphy, the Pallottine Fathers, the people and priests of Kilmeena and Westport and those who contributed to his formation. We pray that through John’s ordination today others will be encouraged to give some consideration to priesthood and the importance of supporting priests in their ministry. Your prayers have been a hugely significant contribution in bringing Fr. John to this day. Could I encourage you to continue to keep Fr. John and all priests in your prayers. We will be faithful to God and generous in our serving of the people of God.